So there's no way that I can start this post without saying how cute is this little guy?! 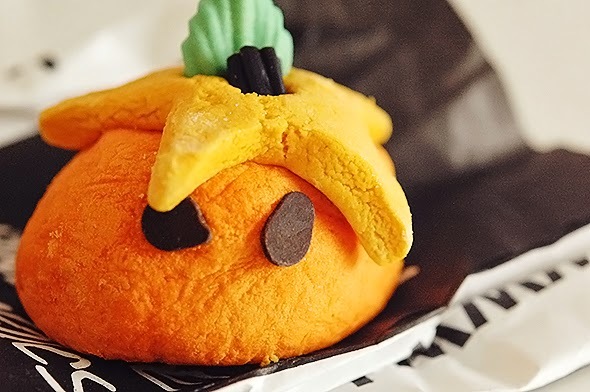 Part of their Halloween collection, Pumkin is a bubble bar that's almost too adorable to use. Almost. If it looks and sounds familiar, that's probably because earlier this year Lush released another bubble bar under the name of Mumkin for Mother's Day. When crumbled under the tap, the bath water turns a vivid orange with heaps of bubbles to accompany it. Pumkin shares the same fragrance as the Figs and Leaves soap, a perfect scent for those colder nights. this is so cute! i don't really take baths very often but having a few of these in my stash would definitely make me want to take one. love your new layout and this looks so cute! I've gone straight to the lush website to have a look! Oh this sounds like it would smell amazing! This is so cute and I need to head to a Lush tomorrow!!!! This is so cute! I love these bombs by Lush! that. I will feel bad when I have my next bath with him and have to break him in half. Haha. Waaah this is so cute. I may have to break my rule and buy one of these! I just saw their Halloween line and have to get some things. That is the cutest. A friend gave me one of their gift boxes last Christmas and it was truly delightful. I love LUSH products. This is just so adorable, I wish I had a tub! That looks so cute and I also love to connect such tiny stuffs. It is really interesting. By the way, is there anyone that wants to try free photo recovery software? I think it works well.